Rimmel Magnif'Eyes Eyeshadow Palette Blush Edition TALC, MICA, ETHYLHEXYL PALMITATE, MAGNESIUM STEARATE, POLYETHYLENE TEREPHTHALATE, PHENOXYETHANOL, POLYURETHANE-11, ETHYLHEXYLGLYCERIN, TIN OXIDE, [May Contain/Peut Contenir/+/-:IRON OXIDES (CI 77491, CI 77492, CI 77499), TITANIUM DIOXIDE (CI 77891), ULTRAMARINES (CI 77007), MANGANESE VIOLET (CI 77742), CARMINE (CI 75470), ALUMINUM POWDER (CI 77000), CHROMIUM HYDROXIDE GREEN (CI 77289), CHROMIUM OXIDE GREENS (CI 77288), FERRIC FERROCYANIDE (CI 77510)]. 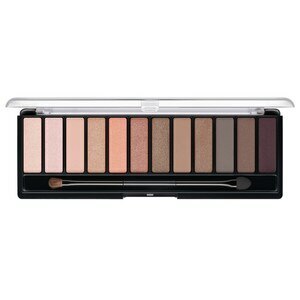 Every-day-palette for multiple eye looks and eye shapes. Apply a light shade all over the lid up to the brow bone. Choose a medium shade to add depth. Use one of the darker shades for contouring and definition. For a more intense look, use darkest shade in crease and lower lash line.